Today, we unveiled our innovative new interactive film to the public. And if you haven't heard of augmented reality before, you will now. A Coelophysis dinosaur roams the Attenborough Studio in Who do you think you really are? Who do you think you really are? tells the story of our evolutionary past and uses advanced technology to blend CGI graphics and a live video stream, to literally bring prehistoric creatures to life in the film's studio. It is narrated by Sir David Attenborough and projected on 3 large screens in the Attenborough Studio. 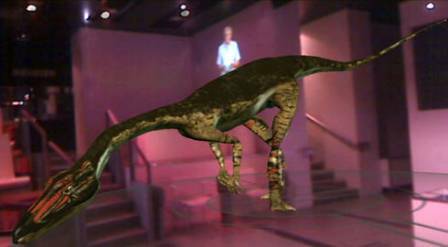 From your seat in the studio, and using the attached unique handset (shown right), you'll interact with the film and witness creatures and objects from the film appear and move right in front of you. A Coelophysis dinosaur (above) and Homo erectus will strut around you and an intricate tree of life stretch upwards majestically. It's the first time that augmented reality has been used in a public, learning space like this. In addition to the wow factor of the film, you'll learn a lot about exactly how we are related to prehistoric creatures and even bananas. The film is showing daily in the Attenborough Studio and is free. Find out about the interactive film, Who do you think you really are? After you've been to the film, you can visit our NaturePlus community and sign in to explore more augmented reality on your home webcam and continue the film's evolutionary journey further.